Perception is an awareness or sense. Once in a while our perception proves wrong or distorted and what we see differs from what we feel. Visually the Poliwog is perceivable as a small knife but when in the hand, it physically feels and cuts like a large blade. 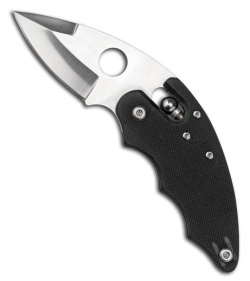 This sense is achieved by pairing an ergonomic handle (notably larger than the blade) with a sharp cutting edge under 2 inches. The outcome is high-level cutting performance in a compact user-friendly package, plus it just plain looks interesting. 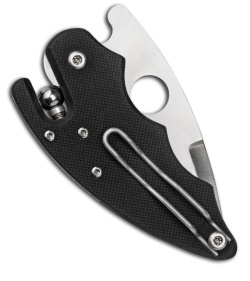 The Poliwog’s G-10 handle holds a Spyderco’s opened-ended Ball Bearing Lock™ rated for heavy-duty use. Its exposed inner workings make the locking mechanism simple to clean by flushing under running water or with a blast of compressed-air. Pulling back on the ball, unlocks the blade ambidextrously from either side of the knife. Curves on the handle naturally settle the hand, placing the index finger into the choil behind the cutting edge optimizing control with less fatigue and pressure while cutting. Made from VG-10, the hollow-ground blade has a weight reducing swedge-grind extending mid-spine to the tip and is Plain Edged. Its ambidextrous wire-tension pocket clip sets the Poliwog tip-up in the pocket.